This is a Sponsored post written by me on behalf of Krazy Glue for SocialSpark. All opinions are 100% mine. Over the past couple of years I have implemented a few changes in my life to help me get (and stay) organized. A few months ago I added a "fix this" page to the back of my Family Planner. (Currently this is just a sheet of lined notebook paper but I hope to get a fancy printable to share with you soon.) On this page I started listing everything that needed to be fixed around our home. Originally this list was used for larger projects that didn't necessarily have to be done right away such as "trim the tree out back before it gets tangled with the power lines" or "replace the broken blinds". However after a recent review of this ever-growing list, I realized that many of the items I have listed are simple fixes and only require a little glue. I would like to tell you that I wrote these items because I didn't have time to fix them at that moment, yet the truth is that I wrote them out of pure laziness. In fact it probably took more time to write down the fix than to actually fix the problem. Another thing that I am not proud to admit to is that I keep a box in our hall closet to place any small items that need repaired (broken toys happen often in this house). While this seemed like a great idea at the time, the box is often forgotten about (out of sight, out of mind) and a few of the items have been in there for several month. Not to mention that the box is getting pretty full. Just like many of the item on my "Fix It" list, the items in the box were simple fixes. I decided it was time to make some changes. With my trusty Elmers Krazy Glue, I went to town fixing everything on my list and everything in our box. If you've never used Elmers Krazy Glue before, I highly encourage you to try it. I promise you won't be disappointed. It is the fast, convenient and dependable fix I continue to trust to repair the items that mean the most to me. Krazy Glue is the instant adhesive that I trust to bond anything from jewelry and collectibles, to shoes and electronics. Krazy Glue for Crafting offers both a craft glue and craft gel formula as well as six different applicators tailored to different types of project needs and a variety of sizes. Glue for Repairs and “Life Hacks” – As America’s #1 instant adhesive, has been saving the day for people since 1973. Available in 7 sizes and 6 applicators, Krazy Glue is the “Tide to Go” of instant adhesives. An active lifestyle requires an instant glue you can depend on. Rely on the Krazy strong, Krazy fast bond for your toughest challenges. Krazy Glue saves the day from life's mishaps and emergencies instantly, while saving you the disappointment and expense of a broken valuable or memory. Fix #1. I purchased these metal shelves along with a few baskets a couple years ago to provide some additional storage for the girls' ever-growing amount of toys. However the youngest used to step on the bottom shelf to reach the items on the top shelf. After only a couple month the bottom shelf gave way and it has been broken ever since. I've never used Krazy Glue on metal before so I was curious as to how it would hold up. So far it is doing great. Of course my girl is a little taller now so she no longer steps on the shelf, but there are quite a few toys on it and the glue seems to be holding up pretty well. Fix #2. Unfortunately we are not blessed with granite counter tops. However they are covered in "fake" granite. (not sure if there is actually a name for these counter tops but you get the idea from the photos) From a distance you can't even tell they are not real granite. 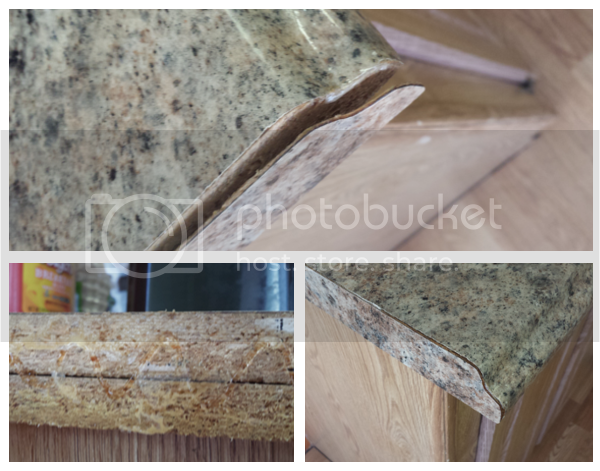 A while back I noticed a strip on the side of one of the countertops became loose. After applying a small amount of Krazy Glue and holding the strip in place for a few seconds, the counter was good as new. Fix #3. This wooden chest was hand made by my great Grandfather. It sits at the end of our bed and holds a few spare pillows and blankets for when guests stay the night. Last month the corner was caught on a bag my husband was carrying and a piece broke off. After applying the Krazy Glue I slid the piece back into place. Within a few seconds the glue was dry and the repair is hardly noticeable. These fixes where so simple and quick, yet over time, my list added up and it took me a couple hours to fix everything. In order to solve this problem, I now keep Krazy glue on hand at all times. I currently have two at my house. One is in my kitchen 'junk' drawer and the other in my office desk. I also keep one in the glove compartment and a spare one in my purse. You would be amazed with how often you can use this stuff for an Instant Fix outside of the home. Just the other day I had to glue a gem back onto my daughters shoe while we were at the store. From her point of view the world was going to end if she lost this gem. (Does anyone else have an overly dramatic 6 year old?) Luckily Krazy Glue Saves the Day. The gem was back on in a matter of seconds and the drama was over. Wherever life takes me, Krazy Glue is my handy, just-in-case weapon to tackle repairs even when I'm on the go. Available in a variety of sizes and applicators, Krazy Glue delivers the strength and speed I need for all of my repairs, giving me peace of mind, instantly. Krazy Glue has a million and one uses. From repairs, to 'life hacks', to creative projects. Be sure to check out their Pinterest boards for some amazing ideas. Head on over to Krazy Glue's Product Page to find the products perfect for your needs. Do you have a favorite Krazy Glue product? What projects have you used Krazy Glue for in the past? 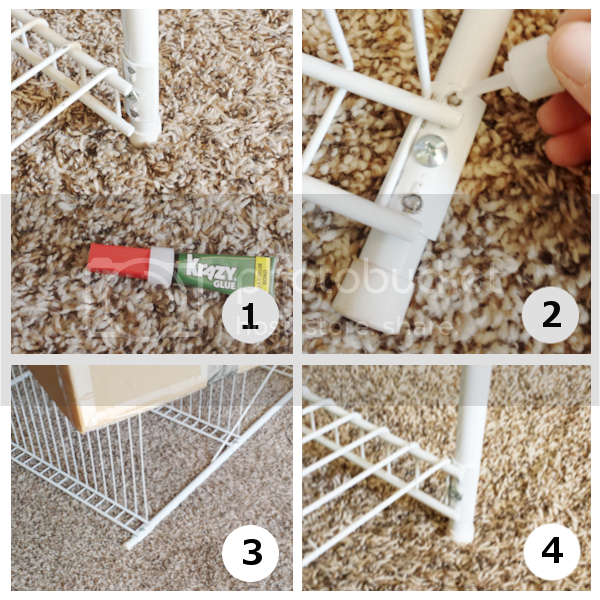 What projects do you have now that could be tackled with a Krazy Glue product?